Updates, news, tips, discussion, retrospection and more. We're very fortunate to have some talented people on board Dream Blue's project. Here's a sneak peak at one of their recent creations. One of the biggest memory makers in any game is the music. A well-timed song often influences emotion and drives players to invest into the story that much more. Dream Blue is committed to bringing an original set of songs and sound effects to Shadow Star; a soundtrack that will stick with players long after they've completed the game. In our attempt to make this happen, we've chosen to collaborate with recording studios, audio engineers and sound effects professionals. We are excited to announce that we are within reach of the end goal. With the vast majority of the music complete, we hope to have the full soundtrack complete by end of 2018. As always, stay tuned for more and thank you to all the fans and supporters who have made this possible! Dream Blue has graciously received the support of a new talented computer graphics artist who will be contributing to creature color and texturing. What a welcome addition, as we move forward attempting to bring you the very best! Also, keep your eyes and ears piqued... Shadow Star's very first "official trailer" is almost here! While our heroes are enjoying searching for petrified beach wood off the coast of Thandor's Cove, we've been hard at work creating new monsters, building cities & programming exciting mechanics! Dream Blue intends to release a fully exclusive set of battler mobs in Shadow Star, something that gamers everywhere rightfully anticipate! While we work furiously to produce fun and fierce enemies, tell us: What monster/mobs do you want to see in the world of Galandria? We'd like to welcome one of the latest additions to our side-view animated battler lineups. Please give a warm welcome, to the lovely Celestrea! We have some frightful creatures awaiting those players who may feel bold enough to wander into the darker corners of the realm. Our advice... Don't stray off the path too much, or you may regret it. While it is a setback, it's a minor one. Dream Blue is bringing on board fresh and talented replacement artists who will help create a world of unique and high quality monster art. Shadow Star continues to move forward and we're all excited to see just what creepy critters and monstrous perils await adventurers in the days to come! Let's face it, side questing isn't typically the most exciting, but every so often a novel kind of quest pops up that piques interest. Do criminal justice quests in games carry the same excitement or fun-factor? Do you enjoy those quests or simply shrug them off? Should Shadow Star consider employing such a quest? We welcome your feedback! We'd like to take a moment to welcome everyone to Shadow Star's official developer website. After a great deal of work, we're pleased to announce that we've also undergone a team enhancement. Previously operating as "GrapeApeGames," we now have an official studio, Dream Blue. 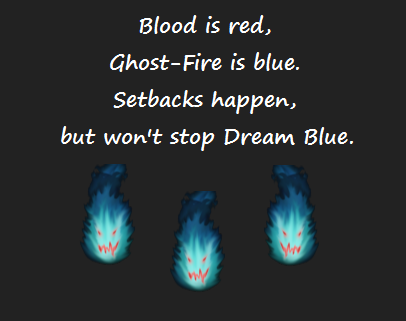 Moving forward, we'll continue to improve and add content to DreamBlueGames.com and invite our fans and the gaming community to partner with us in the exciting continued development of Shadow Star by offering feedback or simply sharing with friends & family. Stay tuned as we'll continue to bring updates via the developer blog and as always, we want to thank our friends, family and supporters! When a person or team comes together to make a video game, it often starts with the end "vision" in mind, but rarely (in my opinion) do indie developers consider all the project commitments involved to bring such a vision to fruition. In other words... having an idea for a great video game is honestly the smallest and likely easiest piece of the puzzle. While the game development piece is the exciting part, there are a host of issues to address in order to afford us a place on the successful-release ladder. While it's been an arduous journey, it's also been extremely rewarding. Members of our team have grown by leaps and bounds in areas of programming, art and music composition. The work isn't done, but we've come a long way and Shadow Star is becoming a quality force to be reckoned with (at least in our biased opinion). With that said, we hope you'll appreciate all the hard work and effort put in by our team. Stay tuned, and we promise to bring you something that you'll be sure to remember for a long time to come!